The easiest fix for this problem is to leave Outlook running. If Outlook is left running, the select profile dialog should not appear when the calendar is being synced. If you prefer to keep Outlook closed, users report having success with the following solutions. Note: Other utilities can cause this dialog to come up too. Any application that accesses Outlook data in a specific profile can bring up this dialog. Leaving Outlook open when the computer is running should eliminate the dialog. I'm repeating this because leaving Outlook open really works. It is the best way to avoid the choose profile dialog. Because the choose profile dialog is the result of a program or add-in that needs to access your Outlook data file, leaving Outlook open and running when the computer is running will eliminate the problem most of the time. When an application needs to access Outlook data and Outlook is not running or when the application remains loaded after you close Outlook, Outlook.exe is left running in a hidden state. Outlook 2007, and to a greater degree, Outlook 2010 prevent applications and add-ins from keeping Outlook open after you close it. Outlook 2010 will disable add-ins that try to keep it open. Set Outlook to always use a specific profile. Go to Control Panel, search for Mail. 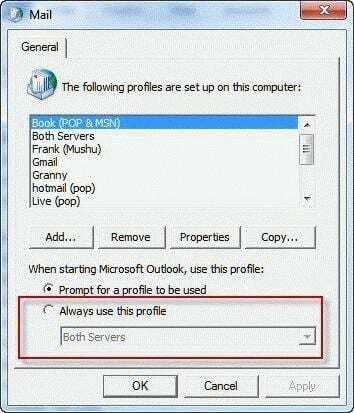 Set the option for When starting Outlook, use this profile to Always use this profile. Note: If you only use one profile, delete any others that are in the Profiles dialog. This will force Outlook to Always use this profile. If this doesn’t help, you could use AutoIt to run a macro and answer the prompt or just leave Outlook open. Some users reported that making a new profile fixed the problem. I'm not sure why it would help, unless the Sync utility was enabled in the new profile. Because new profiles are a hassle, I would try the other methods first. Some users report the problem goes away if you run Outlook as Administrator or switch to a Windows account that has administrator rights. If your calendar is not syncing, verify the sync addin is not disabled in File, Options, Addins (Outlook 2010) or Tools, Trust Center, Addins in Outlook 2007. Why is the addin disabled? As explained in the first method (Don't Close Outlook), Outlook 2007 and Outlook 2010 prevent applications and add-ins from keeping Outlook open after you close it and will disable add-ins that "don't play nice" by wanting to keep outlook.exe loaded after you close it. If you use the Google Calendar sync utility to sync your Google calendar with Outlook and are constantly asked to select a profile, first verify you have the most recent version of the Google Calendar Sync tool installed. Note that 64-bit Outlook is not supported. I too had this problem for a few months. It did not happen when I kept Outlook open constantly. However, I believe that I have found the real problem and the easy solution. Norton 360 was causing me several problems. I got fed up, uninstalled it and installed MacAfee Internet Security instead. Now there are no problems with Google Calendar Sync and Outlook. In this case, at least, the problem was caused entirely by Norton 360. perhaps this is true for other users also. Yeah, Norton 360 seems to cause a lot of problems for a lot of users. Thanks for letting us know, I'm sure it will help someone in the future. I've tried all of these methods, but none work for me. The "Run Outlook as Administrator" is particularly annoying, as a UAC dialog pops up every time I run Outlook; in addition, the Google Calendar Sync fails to load, due to restricted access. So I guess I'm stuck with it. I don't know why this issue started. I used Google Calendar Sync for a year with no issue, then all of a sudden it started to happen. It sounds like your security settings changed. What is the exact error message you get?